Because of them and their generosity, Bill and I have been able to catch our breath and get to the place we are now. We feel supported and encouraged. We feel understood and embraced. And most importantly, we feel our little girl has a team of friends who are willing to do almost anything for her. Today we experienced their latest endeavor. Just when we were feeling our bluest about our fun trip coming to an end, I received an email telling us about the Welcome Home party our wonderful Santa Barbara friends had in mind. It totally lifted our spirits and made us remember how great it is to be home. 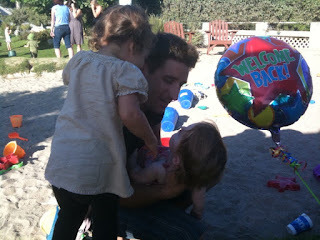 That party was today and we had so much fun seeing them, seeing their babies, and catching up on the summer fun. And Gwendolyn had a blast, too! Thank you so, so much for such a wonderful welcome home and for making a difference in our lives.